Barry Foster reports that at the end of testing on Tuesday - which began on Monday, with the car that won the Mobil 1 12 Hours - the #2 Audi R10 hit the wall at the exit of Turn 1 at Sebring. Allan McNish was at the wheel, and in windy conditions, with the suggestion that debris was being blown onto the racing surface, the Scot lost control and hit the tyre wall, with the car ending up on top of the tyres. He is fine – and the car suffered very modest damage: mainly bodywork. It is believed that the car could have been repaired to run on the (planned) third day if necessary. Huge relief that race-winning driver is all right – and proof that the R10 might be even more indestructible than the R8. Three other teams have been testing at Sebring since the race: ACEMCO, Risi Competizione and Petersen-White Lightning. Audi Sport UK's Martyn Pass adds conisderable detail to this incident - plus other Audi R10 news. What happened to Allan McNish while testing at Sebring? About 30 minutes before the end of the private Audi Sport test session at Sebring, Allan spun with the #2 Audi R10 TDI in Turn 1 and crashed rearwards into the tyre wall. When the car hit the tyre wall it turned slowly over and ended upside-down. No. The car proved to be very safe. Allan is fine, talked to the team over the radio and was able to leave the cockpit on his own. How badly is the car damaged? The monocoque is not damaged at all, only the rear of the car (suspension / gearbox etc.). It would have taken about three or four hours to get the car running again, but the test session was anyway almost over. Allan was running on a very fast pace at the moment of the accident. There were heavy and changing winds at Sebring on Tuesday. Allan was simply a touch too fast. How fast was Allan travelling when he spun? How does this accident affect the test programme of the R10 TDI? Not at all. The only problem is that some parts which have been on the car for over 24 hours can’t now be examined as planned. Can you comment the results of the private test session? As usual, Audi Sport will not comment any private testing results. When will Audi announce the drivers for the American Le Mans Series? We plan to announce it next week. 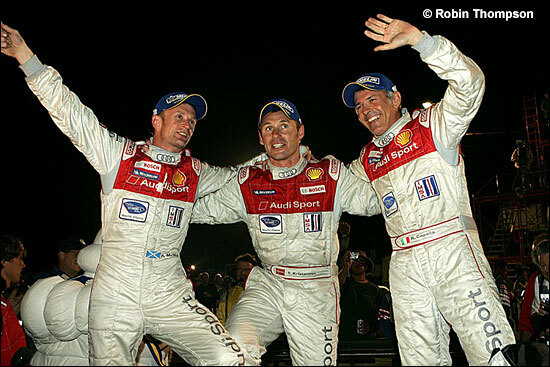 Below, an altogether more satisfactory Sebring moment for the Scot and his partners.